'Thank you' just doesn't quite seem appropriate today. It's difficult to tell someone 'thank you' for your son/daughter /father/mother /husband/wife/ brother/sister/ aunt/uncle,etc giving their life for another. So today my words, to all of those family members who have known and still live with the pain of the loss of their loved one because they wore a uniform and fought for our country, are "I'm sorry". I am sorry for your loss, but mostly I am sorry that I have taken it for granted. I'm sorry that I haven't considered the price paid for all of the things that I take for granted every single day. Things like even being able to type this and share these words publicly. Things like being able to assemble with the people of my choice in the house of worship of my choice. Things like being able to share my voice and exercise my choice in selecting who governs. And these are just a very few of the things. 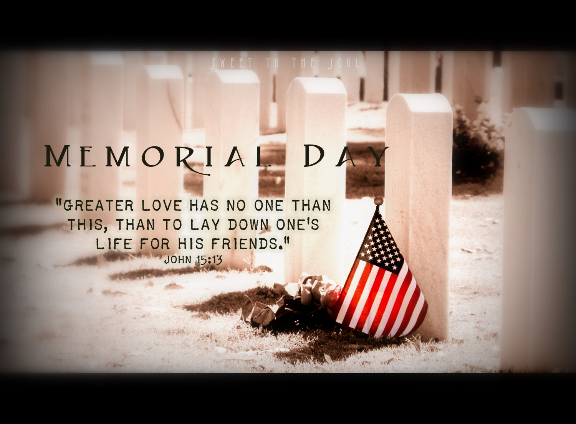 My God bless the sacrifice made by so many, and may all of us who live with the freedoms their lives have purchased, strive every day to live a life worthy of the price which was paid.